It was a night to remember for three members of the 2012 UConn football team. After relatively understated NFL debuts for Blidi Wreh-Wilson and Nick Williams in Thursday's NFL preseason games, Dwayne Gratz, Ryan Griffin and Sio Moore stormed out of the gates in their first pro games. 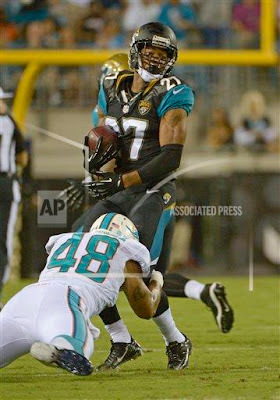 Gratz had a second-quarter interception to provide one of the few bright spots in Jacksonville's 27-3 loss to Miami. Griffin had four catches (all in the first three possessions of the second half) for 37 yards in a 27-13 win over Minnesota. Griffin's first professional catch was a 2-yard grab on the third play of the third quarter. 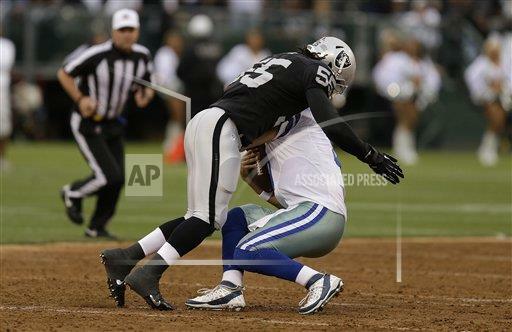 Moore wasted little time in making an impact as he had a sack of Dallas quarterback Tony Romo on Oakland's second defensive snap. Moore finished with a pair of tackles in the 19-17 win. Here are some quotes from Moore from the Raiders official site. On pregame jitters: "The first play, I was kind of in a surreal moment. After a while you have to play ball." On his early sack: "Man, it just helped being able to play, to tell you the honest truth. Mike Jenkins came up to me before the game and was just like, 'Alignment. Know your assignment and the rest will happen as it comes.' I was excited to be out there with the guys." On interaction with the crowd: "Yeah, I had a little fun with them. We had the music going and it was good to interact with them and come up with big plays. It's crazy when they get loud and I love it." On early responsibility within the defense: "It's great to me because it means the coaches want to be able to put me in positions and I want them to be able to trust me, and the bigger thing is for teammates to trust me as well. I just want to for what I have." On hitting someone besides teammates: "It's way more relieving to go against another team. Now we have a bigger one next week coming up and I'm just happy to keep building the team." On the speed of the NFL: "It's faster. Half of an alignment that's wrong or half a step late can get you beat or put you out of position. It's about going back and watching the film and being able to see what I can fix, change, or be able to put myself in a better position."